I've been fortunate enough to speak multiple times to various groups of teachers across the state about differentiating reading instruction. The conversation always includes engaging students through our own excitement about reading, providing time in class for students to read, allowing students to choose what they read, and supporting students in their reading with a variety of strategies; strategies that are individualized based on individual student needs. One question that frequently arises from teachers is where to begin with these journals at the beginning of the school year. 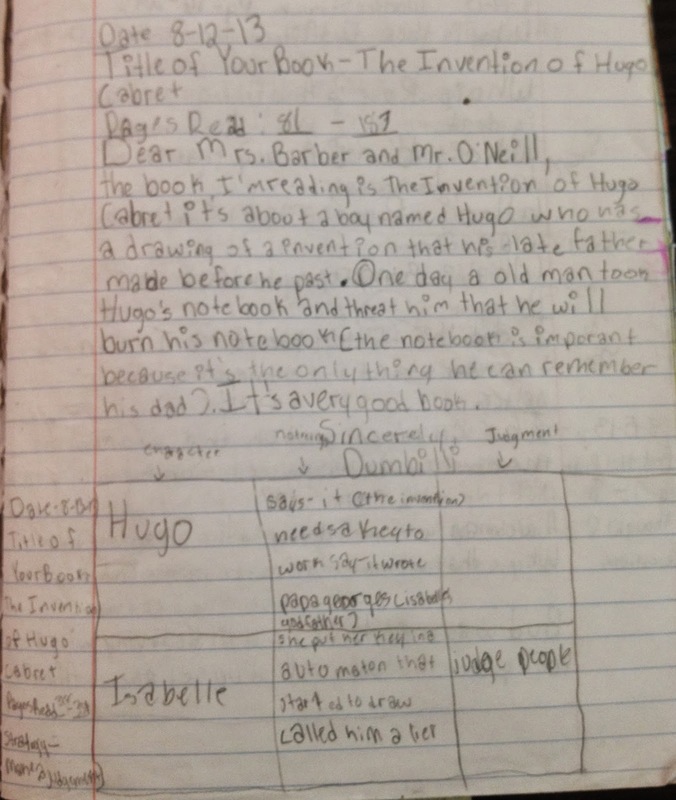 We do assess our students' notebooks using rubrics, however we provide students with a few weeks' worth of journal entries before those assessments become grades. I looked back at one student's entries from the beginning of last school year to share where this 5th grader was at the time. The entry above is really two comprehension strategies combined into one entry. 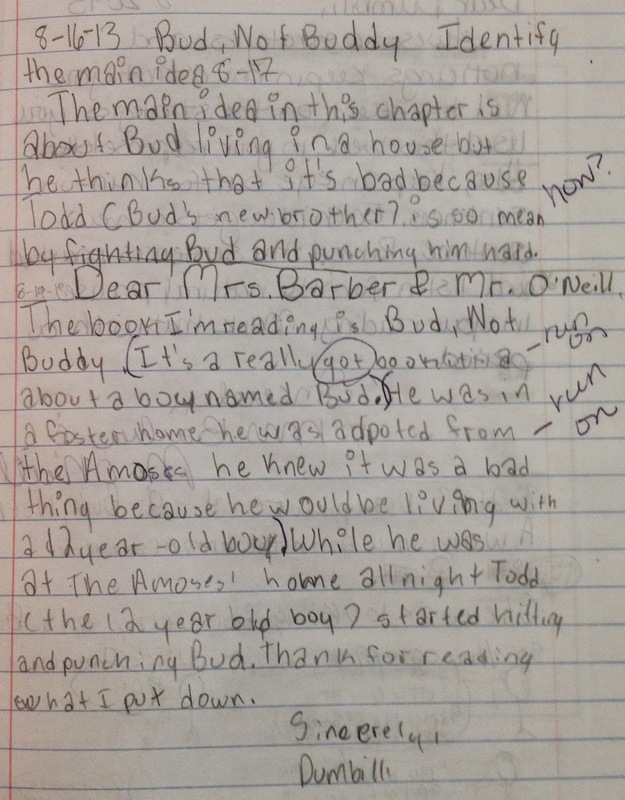 The student wrote a summary and used a chart to track noticings and judgements she made on two characters in her book. Our goal is not to create an abundance of work for students so I suggest to the student that she focus on one strategy at a time (personally, had she finished the noticings and judgements chart, I think this is higher-level work). The very first thing that I noticed after looking at the entries above is that in three days, she has now focused on three different books. I distinctly remember conferring with this student regarding the amount of thinking that should occur throughout a text. She was moving so quickly through her books that she wasn't comprehending on a level that matched her abilities and wasn't doing the thinking necessary to extend her thinking either. I do like that she mentioned why she selected asking questions as her strategy. "I did this strategy because I wanted to understand the characters better." This is evidence of her metacognitive strategies that she possesses. 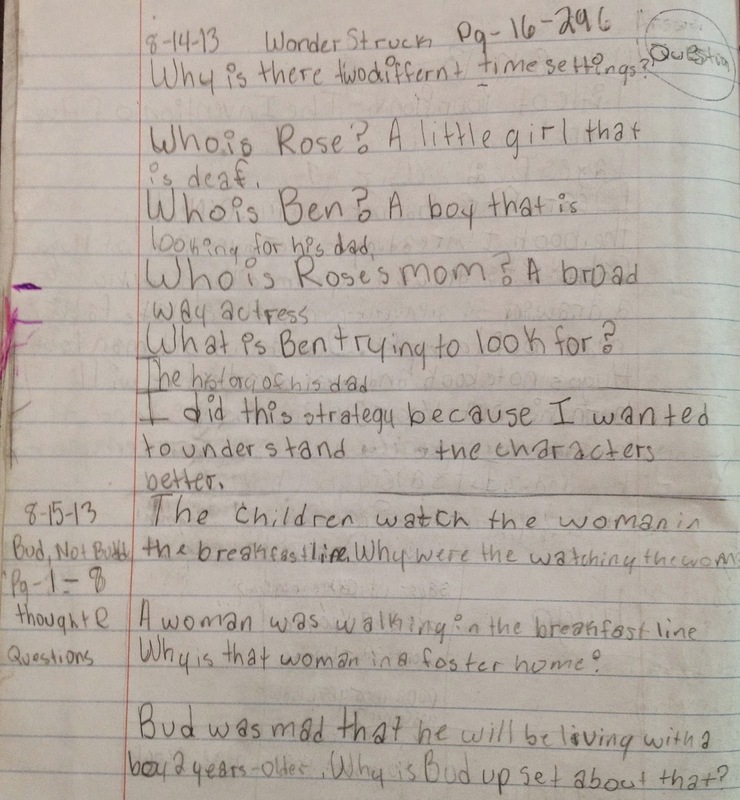 A teacher can see that this student already took the suggestion from her conference (to slow down and look more in depth at the pieces of her story) and is doing that here as she is working with the same book she had yesterday and is discussing the main idea of a chapter rather than the main idea of the entire story. While to some these may not seem like reasons for celebrations, they certainly are! Celebrating that a student was "coachable" will increase the likelihood that the student accepts future suggestions. 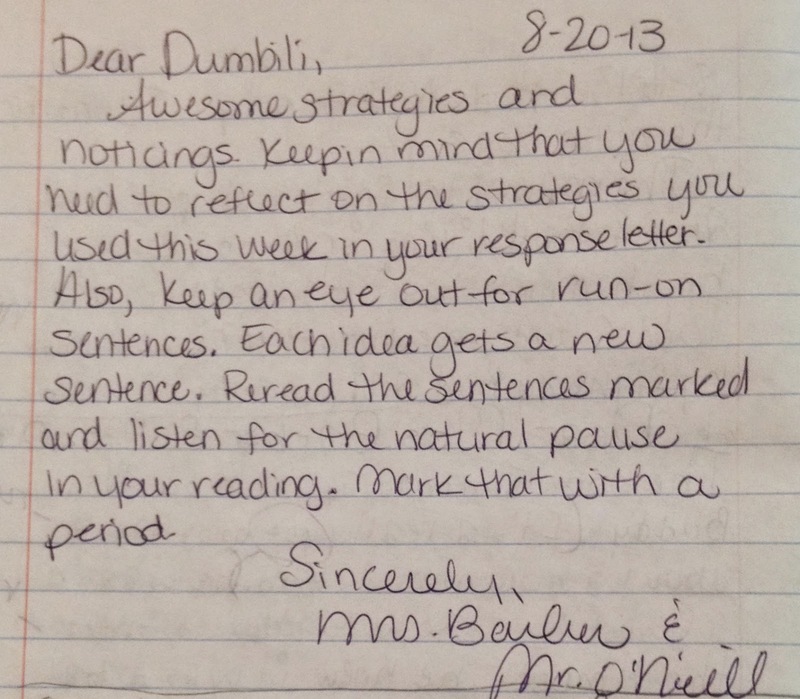 My amazing co-teacher, Mrs. Barber, wrote back to this student. Just like the structure of a conference, Mrs. Barber began her note with a compliment and then provided guidance for the student to both improve her entries as well as to improve her writing. 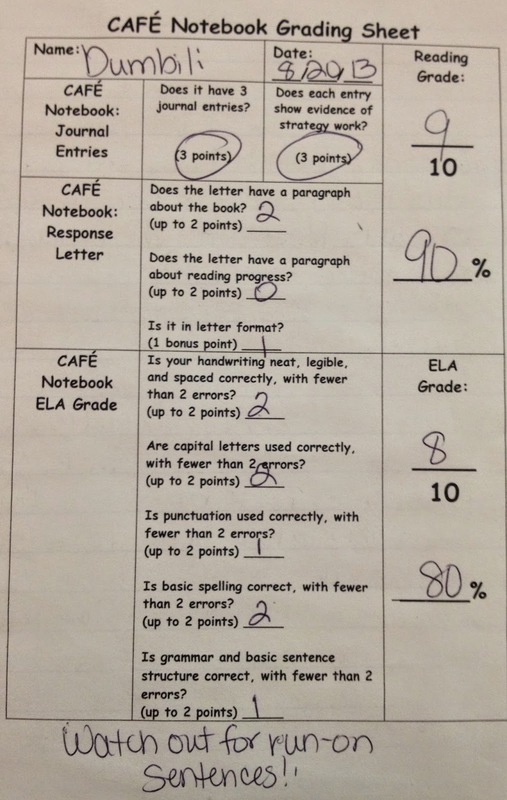 The rubric above (which we were using at the beginning of the school year - See link for most recent rubric) was used to assess the work of this student but it's important to note that this was not taken for a grade. We wanted to provide feedback to our students so that they could grow without them feeling like they were instantly being judged. We were able to confer with each student and discuss what they did well as well as areas where each student could improve. Overall, I hope this has been helpful as has reduced some of the trepidation some teachers are feeling in rolling out reading response journals. They certainly do not need to be perfect, but the beauty of the notebooks is that they truly show where students are and through consistent usage also show student progression throughout the year!